Women often describe their menopausal experiences as an emotional rollercoaster. Among other psychological conditions, such as depression, anxiety, or panic attacks, they also experience uncontrollable bouts of anger. These episodes usually come unannounced and can be initiated by otherwise harmless triggers, making every-day functioning quite challenging. 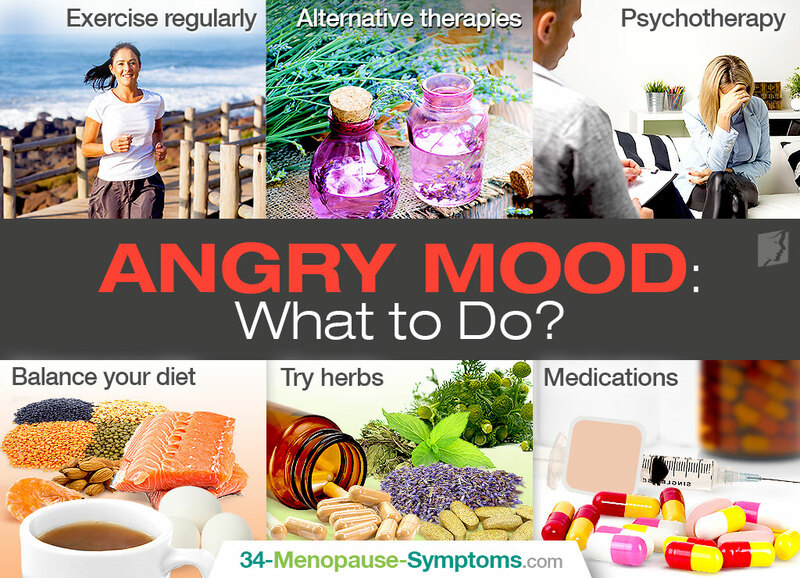 Angry mood can be treated in several different ways, both with medication and through certain lifestyle changes and alternative therapies. Continue reading to learn what to do for your angry mood. Regular physical activity has long been recognized for enhancing mood as it gives your serotonin, dopamine, and endorphins a healthy boost. It also allows you to release the accumulated energy, which could potentially result in anger fit, in more productive way. Find your favorite way to stay active: try yoga at home, take dance classes, or do morning walks out in the fresh air. It will have great impact on your brain's health and will also improve the quality of your sleep, which might decrease your irritability. You can learn how to control your anger with meditation and mindfulness. Breathing techniques can help you overcome bouts of anger. Acupuncture, used for centuries, might reduce the severity of mood swings, while aromatherapy with essential oils can promote relaxation and calmness. Therapies, such as cognitive-behavioral therapy (CBT) or emotional freedom technique (EFT), can teach you how to gain more control over your thoughts and emotions. With the help of a mental health professional, you can practice preventing anger attacks more effectively. Certain therapies can also help you become desensitized to various triggers, so they no longer have an ability to make you angry. Eating well can help you keep your angry mood in control. Avoid alcohol and cut down on stimulants, such as caffeine and sugar. Foods packed with omega-3 fatty acids, choline, and magnesium can improve your overall mood and make you feel more emotionally stable. Other substances, known to alleviate symptoms of angry moods, include tryptophan, tyrosine, and gamma-amino butyric acid, which can be found in foods like kefir, beans, shrimp, or pu-erh tea. Incorporating herbs, recognized for reducing anger and mood swings, into your diet can also bring a relief. They include chamomile, valerian, chaste berry, or peppermint. Moreover, two herbal supplements, which can affect the hormone levels and reduce the occurrence of angry moods, are phytoestrogenic and hormone-regulating supplements. Ask your doctor if medication is good for you. Hormone replacement therapy (HRT) is frequently used in menopausal women to restore hormonal balance and reduce angry moods, but it has been linked to numerous side effects. Other commonly prescribed drugs for angry moods are mood stabilizers, such as lithium and anticonvulsants.